The Czar LP has been reissued on CD and as a double LP in August 2007 by the UK Label Sunbeam Records, www.sunbeamrecords.com. This new release features the original 7 LP tracks plus 8 bonus tracks most of which are previously unreleased. The CD release features a 12 page booklet with interviews with Bob Hodges (keyboards) and Mick Ware (guitar) The CD catalogue no. is SBRCD5040 and is also available from Amazon www.amazon.co.uk. The LP and CD are also available in some HMV stores. Some of the original album tracks are available as downloads from New York based Anthology Recordings, www.anthologyrecordings.com. To listen to some of the tracks from the original LP go to the following link: http://profile.myspace.com/index.cfm?fuseaction=user.viewprofile&friendid=134883245. The original LP tracks are also now available from Amazon and Itunes as downloads, courtesy of Universal who originally released the LP in 1970. 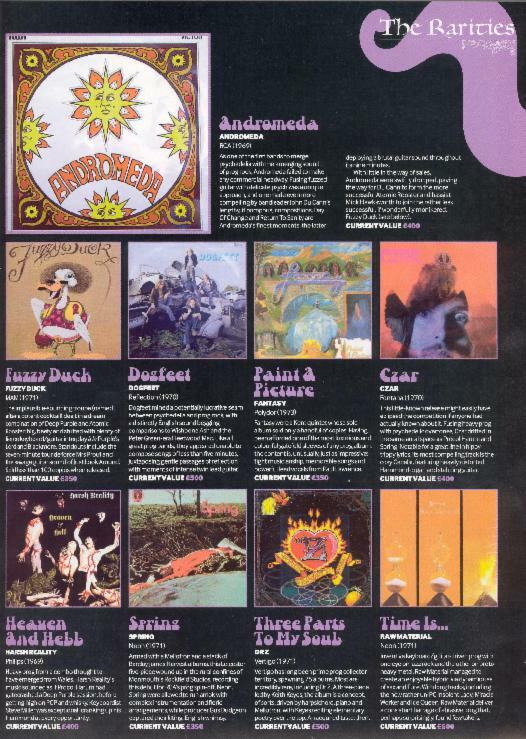 Above, the back cover of the Sunbeam Records CD, note the track listing. The first 7 ttracks are thase on the LP as described below. The bonus tracks are listed further down. Above, the Sunbeam Records double LP, catalogue no.SBR2LP5040, the first LP is the original CZAR album and the second LP is the bonus tracks. Sunbeam Records have made an excellent job of of this and the LP's are pressed on heavyweight virgin vinyl for best quality reproduction. The story of the making of the CZAR LP started in 1969 when TUESDAYS CHILDREN were asked by Philips Records to make an album. The line up of the band was then Mick Ware on guitar, Paul Kendrick on bass guitar, Bob Hodges on Hammond organ and Derrick Gough on drums. Tuesdays Children had already recorded a single for Philips which had been released on the Mercury label (see Tuesdays Children page) and staff producer Brian Shepherd was designated to work with the band. The recording sessions started on the 17th January 1969, there were 12 in total, the final session being on the 27th February 1970. All the sessions took place at the Philips headquarters studio at Stanhope Place, near Marble Arch London. Although Brian Shepherd was the nominal producer of the album, he did not attend many of the sessions and the two engineers, Dave Voyde and Roger Wake did the production in conjunction with the band. They are credited as 'Production Engineers' on the LP sleeve and whilst they looked after the technical side of the recording, it was left up to the band themselves to arrange the music in the way that they wanted. The first songs that were recorded were covers, which included a long version of the Byrds '8 Miles High'. After a couple of verses this went into a long improvisation section that included Mars from the Planets Suite by Gustav Holst. This had been a highlight of the live set but although this song was finished it was not included on the album, there are probably two reasons for this: the estate of Holst wouldn't let anyone release different versions of his music, and secondly, Philips wanted an album of original material. One day in the spring of 1969 the band were round at Paul Kendrick's parents house in Leyton when Paul mentioned that he had written and recorded some songs. Both Paul and Mick Ware had bought stereo reel to reel tape recorders on which it was possible to bounce tracks which meant that you could multitrack, although there was significant loss of quality if you did it more than 4 or 5 times. Anyway we sat and listened to Paul's songs and liking what we heard we decided to rehearse and record some of them. Armed with this original material we then went back into the studio and continued to record. As 1969 progressed Paul wrote more songs which we recorded, Mick Ware was also busy and we recorded his song 'Today' later in the year. (The Akarma CD release credits Mick with writing 'A Day in September', that song was written by Paul, the original LP cover is correct). The band was also performing a lot, still as Tuesdays Children, and although some of the sessions were 3 hour mixing or vocal sessions, some of them were all nighters when the studio was not being used by anyone else, which gave us the freedom to experiment and also for me to use any of the hired instruments that were in the studio at the time ie. Mellotron, harpsichord, celeste. We did perform all the songs on the album live, although I had to make do with just Hammond organ and electric piano on stage. One of our specialities was 3 part harmony vocals (we all sung except Derrick Gough), and we spent a lot of time in the studio on the vocals. Most of the vocals are double tracked, in those days you would lay down one vocal track and then sing another over the top of it which thickened up the vocal sound as the second track would be slightly out of synch. with the first. Eventually we got to the end of 1969 and the band had completed most of the album, we had also decidedto change the name and relaunch the band as 'Czar'. We felt that 'Tuesdays Children' was too 'poppy' and as we were heading in a new direction, a new name was needed to go with the new music and image. the first gig as 'Czar' was at Londons' Marquee Club in Wardour Street on 17th January 1970, and although we still had a couple of gigs booked as Tuesdays Children, after that we became known as Czar. Unfortunately in January 1970 Derrick Gough decided to quit the band and we held auditions for a new drummer on 15th February 1970 at Bells Studios in Ilford, Essex. We had advertized in the Melody Maker and we audtioned 9 drummers that day. We offered the job to a guy called Alan from Hampstead who we felt fitted in best with the band. We had one days rehearsal on 20th February and we went into the studio on 22nd February for the penultimate session for what had now become known as the 'Czar' LP. The final tracks recorded were Cecilia and a reworking of Ritual Fire Dance from the ballet El Amor Brujo by the Spanish composer Manuel de Falla. 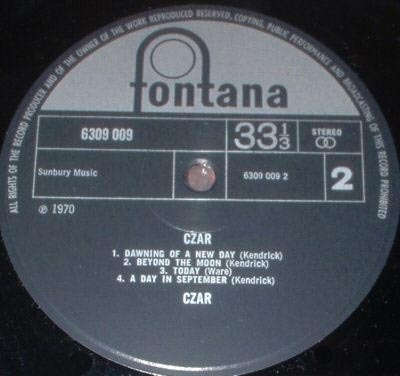 (see other Czar recordings page) This had been intended to be the final number on the LP but there were copyright problems and so 'A Day in September' was substituted. New drummer Alan from Hampstead (don't have his surname on file) did a great job on the recordings and the final session was on 27th February when we completed the vocals on Cecelia and produced final mixes of both songs. The recording was now complete and Philips could get on with the release of the LP. After one gig in March 1970, drummer Alan split from the band and we had a series of dep drummers until Tony Mac joined in July 1970. 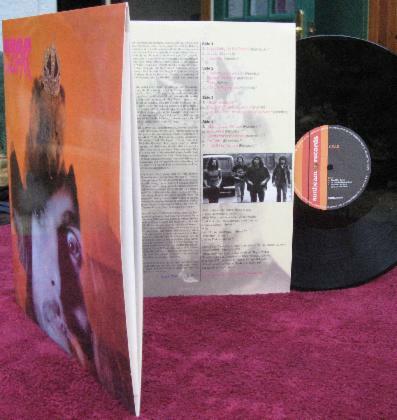 The band was also having management problems and consequently when the album was finally released in May 1970, (Fontana 6309009) there was virtually no promotion. We had all worked hard on the recording and the lack of success for something that we felt was really good was a great disapointment to us all. New management came along in the form of Anastasia Promotions (Jonathan Brewer and Robert Patterson) in June of 1970, but although they tried to repromote the album they did not have much success. The decision was made to rehearse and record more new material and continue to develop the band with original material. This is the only track that does not have Hammond organ on it. The Mellotron sound on the intro is a dirty brass sound, with strings on the middle 8. We had terrible problems with the tuning on the Mellotron on this session, but I think that this adds character to the sound. I also played piano on this track, the Philips studio piano was a large Steinway grand that produced a really good hard sound, ideal for rock playing. Vocals are double tracked throughout and Mick overdubbed his top notch guitar solos. This track featured Alan from Hampstead on drums, and was largely arranged in the studio, I managed to incorporate organ, mellotron, harpsichord, and piano on the track (largely due to the fact that Philips had upgraded their studio to 8 track instead of 4 track which most of the rest of the album had been recorded on). 3 part harmony vocals, all double tracked and another fine guitar solo from Mick at the end of the song which features stereo tricks and a change of tempo to triple time. Pauls bass playing rock solid as ever on this track. This is quite a short track at just over 3 minutes, we thought it could have been a single with its catchy chorus. This was the first part of what was to be a sequence of songs, the rest of which were not completed. Mick plays acoustic and electric guitars and there is organ, piano and Mellotron overdubbed. Plenty of double tracked harmony vocals and an undermixed organ solo. This is a strange track in 6/8 time that features Mick playing on a slide guitar that he made from an old electric guitar that he had had for years. We did perform the song a couple of times live but as Mick had to change guitars and sit down with the guitar on his lap to play it, it was a bit difficult to do in a live situation. This was the one song written by Mick that made it on to the LP. Mick was good at writing dramatic ballads and this was one of the best that he had written at the time. His lead vocal is not double tracked and he hits the high notes with power and confidence. We overdubbed acoustic guitar, celeste and Mellotron strings (thankfully in tune) on to the usual guitar, bass, organ and drums. This track was unfinished as it wasn't originally intended to be on the album, but was substituted for 'Ritual Fire Dance' which could not be used for copyright reasons. There are no overdubs and I guess that this recording most closely resembles the sound of the band on stage. No doubt we would have added other instruments to the track if we thought that it would end up on the LP. The vocals are however double tracked and Micks detuned guitar features heavily, playing in octaves. This number was great to play live, the gradual build up of the intro for almost 2 minutes leads into the chorus and then the verse which then chugs along at a good pace until the song is brought down again to a reflective guitar solo which leads back into the chorus and the joke ending (Skaters Waltz). This is the February 1970 recording that was supposed to go on the LP but there were copyright problems so it was replaced by 'A Day In September' See the 'Czar- Other Recordings' page for futher details of this track. 9: Oh Lord I'm Getting Heavy and 10: Why Don't We Be A Rock And Roll Band. These tracks were the single released in December 1970, see the 'Czar-Other Recordings' page for details. All the above tracks were written by Paul Kendrick and were recorded in Wessex Studios, London in 1971, the producer was American Don Hunter who had links with Motown. The line up on these tracks was Paul Kendrick on 12 string guitar, Mick Ware on guitar, and Jonny Parker on drums. These tracks have been transferred from demos and they show the direction Paul's songwriting was taking during this period. These tracks were never released at the time, they make their debut on the new CD. Apart from the Akarma CD AK342 (above) issued in late 2005, which has the original 7 LP tracks on it, there is a bootleg on Fingerprint Records, CDCR2171, (released in 1995) and I have heard of a counterfeit vinyl LP that seems to originate in the USA. I have also seen on the internet a reference to a CD on the Progressive Line label, PL538, issued in 2002. The Fingerprint Records CD apparently was transferred from an original vinyl copy of the record and has as bonus tracks the 1970 single 'Oh Lord I'm Getting Heavy'/'Why Don't We Be A Rock & Roll Band'. All of these, together with copies of the original LP turn up reasonably frequently on Ebay, the LP often going for considerable sums of money. The 1995 bootleg CD on the Fingerprint Records label. I think it says it all really. There is quite a lot on the internet about the LP including quite a few revues, most of which are quite complimentary.